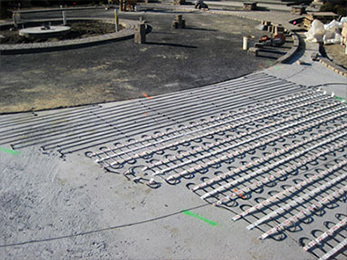 ProLine Radiant carries the highest quality heated driveway and radiant snow melting systems available. From large heated driveways and parking areas to custom sized walkways, ramps and loading docks, the ProLine snowmelt system is the premier snow and ice melting solution for both commercial and residential applications. 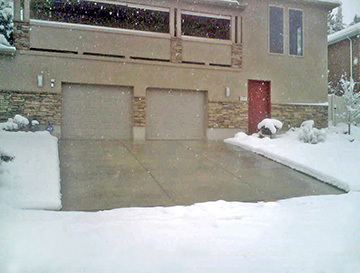 Featuring fully automated, energy-efficient operation, the radiant snow melting system is virtually maintenance free, easy to install and can be customized to meet the needs of just about any project, including retrofitting existing driveways. The ProLine electric snowmelt system can be utilized for a variety of radiant heating applications, making it a popular snow and ice melt solution among homeowners and professional builders alike. 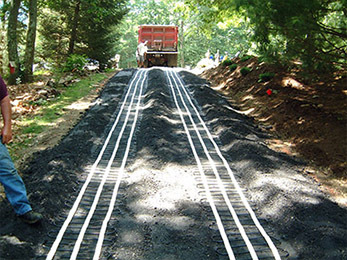 The heat cable is available in mats and on the spool, making it a versatile, easy-to-customize solution for all types of custom snow melting applications. The cable can be installed in a variety of mediums, including concrete, under pavers, and even in hot asphalt applications. Electric heated driveways are fully automated, activated by a high-tech snow sensor that activates the snowmelt system when it detects precipitation and the temperature is below 39° Fahrenheit. Installing a radiant heated driveway not only eliminates the time consuming, arduous task of manual snow removal, but enhances safety and increases the value of your property. ProLine Radiant carries industry leading electric heated driveway systems that come with a 10-year manufacturer warranty and can be customized to meet the unique requirements of your driveway's layout. Heated walkway with stone pavers. ProLine roof deicing and gutter trace systems are the best available radiant heat systems for preventing hazardous ice dams and icicles from forming. ProLine offers roof deicing systems and the industry's top self-regulating heat cable for all types of applications, including new construction, remodeling and existing roofs. Roof heating systems provided by ProLine Radiant are at the top of their class in performance, efficiency, ease-of-installation. These proven, electric deicing systems provide energy-efficient, maintenance-free operation to discreetly protect your home and enhance safety. Visit ProLine's roof heating web page to learn more. 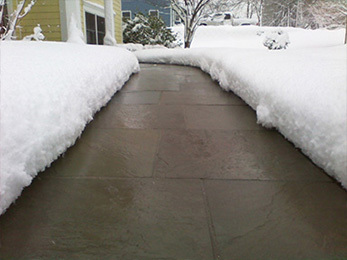 Radiant snow melting systems are only as good as their installation. When you work with ProLine, you're assured of receiving the system design and techinical support you need for a successful installation. You can also receive free installation training from ProLine. Call a ProLine radiant heat expert today at 866.676.9276 to learn more.